Our DtO engagement starts with the equipment design intent. We assign a team of knowledgeable engineers and manufacturing specialists to understand how the equipment should perform, and whether the existing design meets the customer’s business needs. The performance, function, cost, and manufacturability requirements are reviewed. We assess any gaps and risks, followed by a recommendation of appropriate activities to meet a successful outcome as defined by our customer. An experienced program manager then ensures the project is executed flawlessly through final delivery. Whether the need is for building highly-specialized automated equipment to support factory expansion, or introducing a brand new complex capital equipment product to manufacturing, Owens has the expertise and experience to make your difficult-to-outsource projects successful. Replication of a custom reagent/bead dispense system for manufacturing POC (point-of-care) medical devices. Customer had limited documentation and required additional engineering design for integrated inspection and increased throughput. Migration from prototype to production builds of capital equipment for a semiconductor OEM (original equipment manufacturer). Project required deep understanding of semiconductor industry standards, NPI (new product introduction) documentation, and highly skilled troubleshooting and final testing expertise. Relocating manufacturing from Europe to U.S. for a bioscience instrumentation company. Design was refreshed, manufacturability improved, and control system updated. Commercialization of medical radiography LINAC sub-system. Prototype design was revised for manufacturability; build and test documentation created; high power electronics troubleshooting required. Solar PV manufacturing expansion required replication of equipment set originally designed by the customer’s engineering team. Little documentation remained from original effort. 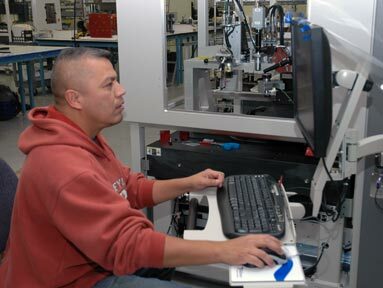 Manufacturing documentation created and design updated to address reliability and performance issues.